Latest information continues to point to a significant 7.2 percent increase in 2013 world cereal production to 2 479 million tonnes, a new record. FAO now puts world wheat output in 2013 at 704 million tonnes, an increase of 6.8 percent, which would imply more than full recovery from the previous year’s reduction and bring world production to its highest level in history. By far, the bulk of the increase this year is expected to originate in Europe, as prospects remain favourable overall in the EU and outputs in the major producing CIS countries are forecast to rebound sharply from drought-reduced levels in 2012. The outlook is also positive in Canada, Australia and Argentina – other major exporters – and in most other wheat producing and consuming countries. The main exception is the United States, where wheat crop growth has been hindered by adverse weather conditions – drought in particular – this season. World production of coarse grains in 2013 is now forecast by FAO at about 1 275 million tonnes, up sharply (9.7 percent) from 2012. Latest estimates confirm increased harvests in Argentina and Brazil, the two major producing countries in the Southern Hemisphere, while a smaller crop has been harvested in South Africa. Elsewhere, increased outputs are forecast among the major Northern Hemisphere producing countries. In the United States, where maize plantings increased and yields are expected to return to normal after last year’s drought-reduced levels, production is expected to recover markedly. Maize output is also set to increase in China, which accounts for the bulk of the production in Asia, and in the EU, where prospects are particularly favourable in the large maize producing areas of Romania and Hungary. World rice production in 2013 is forecast to expand by 1.9 percent to 500 million tonnes (milled equivalent) with strong gains in all regions except Europe and North America. However, prospects are still very provisional, as July and August are critical for the development of the northern hemisphere main paddy crops. In addition, production growth this season could be dampened by expectations of falling prices and recent policy changes that may encourage farmers to shift to other crops. World cereal utilization in the new season (2013/14) is likely to expand by 3.4 percent from the 2012/13 estimated level to 2 415 million tonnes. Most of this increase would reflect higher feed use, which is projected to absorb 843 million tonnes, 5.8 percent more than in 2012/13. 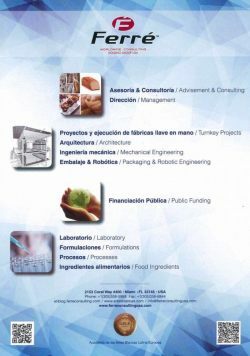 Utilization of cereals for food is forecast to expand by 1.5 percent, to 1 099 million tonnes, which would lift world average per caput consumption from 152.5 kg in 2012/13 to 153.3 kg in 2013/14. Other uses of cereals, including industrial use, and waste (or post-harvest loss) are projected to reach 473 million tonnes, up 3.7 percent from 2012/13. 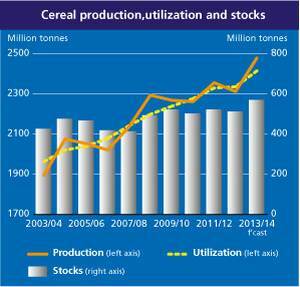 The current forecast for total world cereal utilization in 2013/14 is 13 million tonnes above the figure published in June. The revision concerns mainly coarse grains, with 1 229 million tonnes now expected to be consumed, 12 million tonnes more than was forecast in June and 56 million tonnes, or 4.8 percent, above 2012/13. The upward adjustment reflects stronger projected growth in feed use of coarse grains in the EU, mostly on improved barley and maize supplies in the new season. Compared to 2012/13, the increase in world feed use of coarse grains in 2013/14 would be supported by greater production, while its industrial applications, especially for production of maize-based ethanol, are also forecast to rebound after a decline in 2012/13. Wheat utilization is projected to reach 695 million tonnes, up 1.4 percent from 2012/13 and close to the previous forecast. Rice utilization is put at 491.5 million tonnes, up 2.8 percent from 2012/13 but unchanged from the figure released in June. The forecast for world cereal stocks by the close of seasons in 2014 has changed little since the previous report in June. Early indications for the new season still point to a sharp rebound of world cereal inventories, up 11.5 percent, or 58 million tonnes, from their relatively low opening levels, to 567.5 million tonnes. If realized, this would be the highest since 2001/02. At nearly 216 million tonnes, coarse grains’ inventories would account for the bulk of the expansion in stocks from the previous season, with the latest forecast pointing to even larger ending stocks than reported in June. Wheat and rice inventories are also foreseen to expand significantly, to 169.5 million tonnes and 182.4 million tonnes, respectively. The forecast for wheat stocks in 2014 has been lowered somewhat, mostly on higher anticipated consumption in 2013/14. Overall, the recovery in world inventories could boost the cereals world stock-to-use ratio to 23.2 percent, up two percentage points from 2012/13. The rise would be particularly important for coarse grains, with its stock-to-use ratio reaching 17.3 percent, 3.2 percentage points higher than the historical low ratio of 14.2 percent in 2012/13. Global cereal trade in 2013/14 marketing season is forecast to reach 306.5 million tonnes, up slightly from 2012/13 and nearly unchanged from the previous report. World wheat trade in 2013/14 (July/June) is likely to contract by about 2.6 percent to 136 million tonnes, with most of the anticipated decline stemming from sharply reduced purchases by the Islamic Republic of Iran following a surge of wheat purchases in 2012/13. By contrast, world trade in coarse grains is seen to expand by 3.8 percent to an all–time high of 133 million tonnes in 2013/14. Trade in maize alone could exceed the previous record in 2011/12 and approach 103 million tonnes, fuelled by larger imports for feed by China, Indonesia, and Mexico. Although very preliminary, global rice trade in 2014 is forecast to remain unchanged around the 2013 level of 37.5 million tonnes.